"श्रीपायाशी जडलेली नजर सुटू नये याचसाठी राजांचे जोडे उराशी कवटाळून श्रीमंत सकल-सौभाग्य-संपन्न पुतळाबाई राणीसाहेब सती गेल्या. त्यांची आठवण म्हणून ही चरितकहाणी." आजपर्यंत ५ ते ६ वेळा वाचले आहे. पुन्हा पुन्हा वाचावेसे वाटणारे पुस्तक. शिवाजी महाराज आमचे दैवत. कितीही वेळा वाचले तरी कंटाळा येणार नाही.Law of diminishing marginal utility चा सर्वात मोठा अपवाद म्हणजे हे पुस्तक आहे. Khupach Chan "Shreeman Yogi" Shivrayancha Itihas Ashya Swarupat Vachatana Dhannya Zalo. Respected Sir.....Apan jyaprakare Shabdanchi mandni keli,Sampurn abyas karun jyaprakare itihaas vachakansamor mandla....kharach khup apratim ahe...Mihi aple likhit pustak vachle ahe.....khup chaan anubhav milala.....mla vatat dusrya itihaas lekhakani sudda apala adarsh ghyava..!! I have read this book thrice,and currently I m reading it fourth time, we might have tears in our eyes while watching a movie, a play but having tears while reading a book is something rare i guess, and for that i salute shri Ranjit Desai.I havent read a book as this till date.Someone in above comments mentioned this book as NOVEL, may b i m mistaken, but please dont mention the books on Shivaji Maharaj as NOVEL,its a humble request, i dont intend to offend anyone.We can call it a book, if not a GRANTH.FOR ME ITS A SOURCE OF INSPIRATION, READING THIS BOOK HAS ALWAYS GIVEN ME STRENGTH TO OVERCOME MY PROBLEMS. shrimaan yogi he shiv charitra vachat astana maan bharun yete aani dholyant aasharu tarangtat. kharch he Shiv Charitra sarvani vachayala pahije......Shrimaan Yogi nichyaacha mahameru hindvi swaraj sansthapak chhatrapati SHRI CHHATRAPATI SHIVAJI MAHARAJ KI JAI!!! मी श्रीमान योगी हे पुस्तक किमान १५-२० वेळा तरी वाचले असेल. हे पुस्तक माझ्या घरी आमच्या संग्रही ठेवले आहे. हे प्रत्येक भारतीय मनुष्याच्या हृदयामध्ये आपला देश व आपला धर्म याच्या प्रती आस्था पुत्पांना करण्यासाठी एक अत्यंत प्रेरणादायी स्त्रोत आहे, तसेच आयुष्यामध्ये स्वतःच्या मनगटाच्या जोरावर आपण काहीही करू शकतो असा आत्मविश्वास आपल्या हृदयामध्य उत्पन्न करण्याचे कार्यही हे पुस्तक अत्यंत प्रभावीपणे करते. त्या काळात मुसलमानांकडून हिंदुंवर अनन्वित अत्याचार होत असताना शिवाजी महाराजांनी आपल्या मराठी जमातीला एकत्र करून त्यांच्या अत्याचाराला अत्यंत प्रखर विरोध करून त्यांना त्यांच्याच भाषेत उत्तर दिले व हिंदुस्तानात सनातन धर्म जिवंत ठेवला. तसेच जुलुमाने मुसलमान झालेल्या पीडित हिंदूंना परत आपल्या स्वधर्मात घेण्यास सुरुवात करून सनातन धर्माचा होणारा ऱ्हास देखील प्रभावीपणे रोखला. अशा शिवाजी महाराजांच्या प्रेरणादायी इतिहासाला प्रत्येक हिंदुच्या हृदयात निश्चितपणे मनाचे स्थान मिळते यात काहीच आश्चर्य नाही. jantechha raja mhanun tari ek vel vachhave ase pustak, aaplya pudhil piddhi sathi bhet mhanun dyavi ashi sundhar gatha. https://www.youtube.com/watch?v=FUvheYDqwhU Must watch Mr. Waman Mishram...great intellectual Speaker. 19 february 1630 roji hindunsathi sakshat devanech avtar ghetla ya pruthvivar. Ani toch pude hiduncha rakshankarta zala. Hinduncha pahila raja mhanun raygadavar sakarlelya 32 mani soneri sinhasanavar stanapann houn hinduna 1 adhar dila ki bas ata dakkhan ani swarajya he aplech ahe. Shapat ghetli ki hi rayat mhanje amchi lekure. Amhi hicha potchya porapramane sambhal karu. Ani aaj 400 varshanatar hi mazya rajachi janmanusanchamadhe ji pratima ahe tila pahun ajun pan kutri ghabartat. This is not book or Kadambari,this is immortal gift for all peoples.Hindu hruday samrat Chhatrapati Shivaji Maharajana manacha mujara. Great book... I read three times... far better than raja shivchhatrapati by purandare. One of awesome and memorible book which i read in my life... Hats off for you Ranjit Desai Sir. Jay Jijau.. Jay Shivray.. Dharmaveer sambhaji maharaj ki jayyy...!!! Wande mataram..!!! इन्द्र जिमि जृम्भा पर बाडव सअंभ पर रावण सदंभ पर रघुकुल राज है ! पवन बारिबाह पर संभु रतिनाह पर ज्यों सहसबाह पर राम द्विजराज हैं ! दावा दृमदंड पर चीता मृगझुन्द पर भूषण वितुण्ड पर जैसे मृगराज हैं ! तेज तमअंस पर कन्ह जिमि कंस पर त्यों म्लेंच्छ बंस पर शेर शिवराज हैं!!!!!!!!!!! SHIV CHARITRA CHA ANUBHAV YA PUSTKATUN YETO HE PUSTAK VACHA ANI RAIGADA VAR JA NAKKI RAJE BHETLYCHA BHAS HOEL. UTTAM.. SHIVAJI MAHARAJANCHYA KATHA APLYA SAGLYANA MAHIT AHETCH. PN JEVHA HE SHIV CHARITRA WACHAL TEVHA DOLYANT ASHRU ANI ANGAVAR SHAHARE UMATLE. AISA RAJA N BHUTO N BHAVISHYATI..SHIVAJI MAHARAJANNA MI NATMASTAK HOTE..
हे फक्त पुस्तक म्हणजे फक्त कादंबरी नाही, हे एक मराठी सहित्यातील एक लेण च आहे. प्रत्येक मराठी व्यक्तीने एकदा तरी ल्यावच अस हे लेण आहे. आपल्या महाराजांची कीर्ती सा-या विश्वात जास्तीत जास्त पसरावी हीच इच्छा. संपूर्ण विश्वाला समजुदे आपला राजा काय होता ते! गो ब्राह्मणप्रतिपालक क्ष्यत्रीय कुलावतंस सिंहासनाधिश्वर महाराजाधिराज शिवछत्रपती महाराज !!!! Book chan ahe.....bharpur kahi shikayla bhetala..
Shreeman Yogi pustakane barach kahi shikavale mala. MALA HISTORY VACHANYAT RAS AAHE YA PUSTAKA MADHE SHIVAJI MAHARAJANA SHRIMAN YOGI HI PADVI DENYAT AALI AAHE...THE GREAT CHATRAPATI......................! Marathi sahityatil ek anmol theva sarvani vachavi ashi kadambari. Excellent History of Extraordinary person described very well. One gets into it when we start reading the book. We can feel the narration ! I am reading this book since 2005. I have 2 sets of books with me. It is thrilling to read the book. I read the book so many times that even i can not count. There are 3 lead characters in whole book. 1. Jijamata @. Dadoji Konddev & 3. 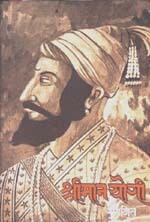 Shivaji Maharaj. For me the character of Moropant is also equally important. I feel very fortunate to be able to read this book in my life. nice book,so very nice history for maharastra. that gives after so many days things will be good. i dont have words to express this wonder about shivaji maharaj amchya rajyancha ha sanman pahun manachya kuthlya tari kopryatun aapan mavle aslyacha aavaz yeto-really thanks to all team behind creation of this book. Hello Koni Tari yha pustakache Audio version ka nahi kaadat ? We are seeing so much controversy about Brahmin Marathi historians like Purandare and people are questioning their authencity. Why can't some of this Virodhis come togheter and create an audio version of non brahmin historian like Ranjit Desai and popularise this book. Write your comments on the book here and click on "Add My Comments". Atishay Sundar,he shabdcha apure padtil. Shivaji Maharaj dolyansamor ube thaktat. Kuthe tri mavlyanmadhe aapanhi ube aahot aani to itihas dolyasamor ghadt aahe ase anubhavle. This is the link for the Indian translation - http://www.indiamart.com/balwantprinters/ Enjoy !!! It was a lively maratha kingdom in front of me when I was travelling thorugh pages of this great KADAMBARI. The only thing that remained ananswered while reading this book is that nowhere Mr. RANJIT DESAI had mentioned the dates of the incidents, I understand its just because to avaoid controversy, to that extent its right thing but a good reader or RASIK will always expect the full information. Its long research that has been done, though its difficult to have exact date but a range or approximate dates will make this novel more lively. It is just a suggestion which left in my mind while reading. No doubt we all are thankful to Mr. Desai for writing this. The author has taken great efforts to write this great epic.I think Ranjit Desai is one of the best kadambarikaar.I have read this book twice.Undoubtedly Shivaji Raje was a Yugpurush.The language used in the book is simple and easy to understand.Some of the incidents are written in such a great way that it takes you in the scene.Even after completion of four decades the book is one of best in the marathi lit. This book is too good to describe in words. The flow of the language is griping. One gets involved as if it were really happening in front of ones eyes. Ranjit Desai has created a classic of it. Took my breath away.....kept on wondering only if maharaj would have lived a little longer.....a matchless commander,survivour.... I remember me n my frndz talkin endlessly about maharaj after reading this book.....feel proud to be maharashtrian....HATS OFF to Ranjit Desai. I have read both books i.e. Raja Shivchhatrapati by Babasaheb Purandare and Shriman Yougi by Ranjit Desai. Both this are books are on their own height. So, you can not compare the same. language of this book is simple and very heart touching, At the same, babasaheb purandare talkes about pre-shiviji era also and Shirman yogi directly starts talking from shivaji's birth. No evidence found regarding some incidents mention about Shivaji maharaj in their early childhood. Rest book is fine. Write your comments on the book here and click on "Add My Comments". Thsi is a wounderful writing which redefines live of Maharaj. All marathi speaking community should read this novel to understand heroic deeds of The Great Maharaj. I read he book twice and each time it left me speechless. I felt as though , I was living in that period of time. The book describes the period aptly and takes us into the life of Great Maratha King.This is must read book.. I read this book when I was a kid as an account of the great Maratha King and I was starstruck with the greatness of Shivaji. Then I read it again as a teenager and in college. This book is not just a historical account of the life of Shivaji like many other books. Ranjeet Desai wrote this book as if he lived with Shivaji. He portrayed him as a human first, a brave soldier, a just king second. He described also a hurting father, a grieving husband and loving son. The language makes you feel closer to Shivajiraje as a person than observe him as a king from a distance. I have always been a big fan of Ranjeet Desai. This book is one of his best books. I highly reccommend this book for anyone who wishes to read about the greatest Maratha king, Shivaji. I read Srimanyogi at a stretch. You cannot just stop reading once you start. In todays India what we see in politics. Every politician or the person who want to become a leader should read it. I felt so much proud to be born in Maharashtra. Too Good !!!!! Too Good !!!!! Too Good !!!!! After reading this book, I just can't explain what i feel. But it was feeling of pride to be in maharashtra. I have read many books on Maharaj but the way Ranjith Desai has written the each incident was like I was the part of his Mavlas. Especially when so called Shivaji Charitrakar like Babasaheb Purandare make the childish descriptions of all his life stories and morals and add his own comments unncessary throughout the book "Raja Shivchhtrapati" , Ranjith Desai has done a great job. One incident i'll not forget in my life. I was reading this book in a local train and I was reading the incident of Bajiprabhu Deshpande.As I ended the paragraph, my eyes were full of tears and people were watching at me but I couldn't stop those imotions. It's a one of the wonderful experinces I had ever experienced in my life. Overall great Book. Must read by every Indian. Sreemanyogi is the most engrossing,contemporary,magnificent emotional saga of Chattrapati Shivaji ,written with utmost sensitivity by Ranjit Desai.The life and times of Shivaji Maharaj have been aptly described.The book takes you to a spectrum of emotions and a ride that keeps you asking for more. No other historical book in Marathi can come close to Sreemanyogi in its language,sensitivity,portrayal of Shivaji Maharaj. Not even Swami!! !